The 25 year old Mozart composed Idomeneo as perhaps the last great opera seria. Amongst it's many glories is his wonderful use of the orchestra and chorus (and it was for these reasons - amongst others - that we chose it). The immensity of the music and the themes have produced a work like no other, and one that is not well understood. Nevertheless, because the opera is a serious opera, unlike any of his mature works except the equally neglected La clemenza di Tito, it has a form and idiom very different from the operas on which Mozartʼs reputation rests today. Idomeneo is a work that for many years has been regarded as a relict, an opera seria carried over into a world whose circumstances were no longer those which had caused the genre to come into being, like a wool clipper plying the Cape of Good Hope in an age when steam freighters took the Suez Canal. In much the same way, it has been treated with a certain sentimental respect – the respect due to an excellently constructed and presented throwback. Nevertheless, it has been regarded as somehow qualitatively belonging to a different age. Certainly it seems to inhabit a different world from that of the da Ponte operas, or even that of its immediate successor, The Abduction from the Seraglio. There are certain distinctive features to it which would certainly give that initial impression. The combination of a classical Greek setting, the serious subject matter, the supernatural influences, and the characters torn between love and duty sets it apart from anything else in Mozartʼs output. At first sight, these elements also look like the stuff of the traditional opera seria, an entertainment conceived in Italy and enjoying the support of the nobility from London to Budapest. Idomeneo does indeed inhabit a different world, but it is not the world of the Italian opera seria. Thematically, Idomeneo is an opera which is a standard bearer for the Enlightenment. Mozartʼs later operas, particularly The Marriage of Figaro and The Magic Flute, are recognised as definitive statements in the cultural history of that movement, but the more traditional form of Idomeneo has militated against its being considered in the same category. Idomeneo also departs from opera seria in its structure, owing far more to the French tragédie lyrique. For a start, its libretto was inspired by that for the French opera Idoménée, written by André Campra and premiered in 1712 in the final years of the reign of Louis XIV. It is highly probable that the Elector was familiar with Campraʼs opera and was taken with the subject matter, and, as was not unusual with commissions, that he chose Mozartʼs subject matter. With more decisiveness than insight, he handed the job of translating and adapting the libretto over to his court chaplain Varesco, someone who was not conversant either with singers or the demands of the lyric stage. The irony of this is that it meant that Mozart had a profound involvement in the shaping of the libretto, as he was very unsatisfied with Varescoʼs contribution. We also, unusually, have a comprehensive record of this, as much of their collaboration was carried out by correspondence, with Leopold Mozart acting as an intermediary. The fact that the origins of the drama come from the French is significant. Nor should it be doubted that the origins are French rather than classically Greek – the figure of Idomeneus, the king of Crete, is mentioned several times in the Iliad, in dispatches, as it were, but beyond that there is no canonical information. He could not be called a great Greek mythical figure – no Achilles, still less an Orpheus, around whom a body of ready-made myth has accumulated. Ciphers such as Idomeneus nevertheless have their purposes. They arbitrarily attract themes which a society needs to explore, and the figure of Idomeneus attracted a particularly interesting one. Like Jephtha in the Bible, Idomeneus makes a promise to a god that upon his deliverance he will offer up the first living being he sees as a sacrifice. As with Jephtha, fate dictates that the being is his offspring – his son Idamante as opposed to Jephthaʼs daughter – and he is faced with a terrible choice of being oath-breaker or filicide. Moral dilemmas of this sort, which in the works of Racine or Corneille are induced by a sequence of conventionally honourable intentions and individually laudable actions, are a feature of French drama. Conventionally, the principal characters look for a way to reconcile their conflicting duties, often finding themselves unable to do so without divine intervention, the deus ex machina which can resolve the irresolvable. Again, Idomeneo appears at first sight to correspond to this format – but even here it has surprises in store. Idomeneoʼs intentions are conventionally honourable in the sense understood by the French, but the purpose of articulating them is not to explore the extent of his honour, but to question the conventions. His actions are individually laudable, perhaps, but socially questionable, and it is his social self which is critiqued by them, not his individual self. The notion that a monarch should have a social self which is distinct from an individual self is in itself radical. The saying attributed to Louis XIV, ʻLʼétat, cʼest moiʼ (I am the state), is almost certainly apocryphal, but it does neatly express the unity of the monarchʼs social and individual self. The opera Idomeneo expresses a very different idea of kingship and divine order. In the traditional tragédie lyrique, monarchy was depicted in the role of the deus ex machina: the god of deliverance is by convention a thinly disguised avatar of the monarch. The king attains a truly divine status (albeit by proxy). It is a convenient dramatic device, and it goes hand in glove with an unassailable belief in the divine right of kings, because it presupposes a variety of ultimate benevolence and purpose to the universe which, once admitted, must embrace a divine hierarchy. Idomeneo is not himself this sort of monarch, nor is the deity of the opera a depiction of one. Idomeneoʼs god inhabits a universe where power is unhitched from benevolence or greater purpose. In fact, both Idomeneo and his god are throwbacks to the Homeric tradition, in which gods and heroes are answerable only to their own quest for glory and power. The purpose of the opera is to show that these gods and these heroes are not what it takes to rule a happy and prosperous state – that civic virtues and Homeric virtues are incompatible and that if the Idomeneoʼs god is proxy for a monarch, then it is a monarch engaged in the blatant exercise of self-bolstering authority at the expense of his subjects. Idomeneo is not thereby exonerated. Mozart would have been very aware of the Enlightenment view that to invoke a god for oneʼs own purpose is blasphemous. That is to say, if God in his wisdom has seen fit to inflict misfortune upon you, it is incumbent upon you to accept that misfortune as being part of the purpose of the higher power. Idomeneo does not accept his misfortune, but tries to bargain. Furthermore, he responds to an unjust god with an unjust promise. Idomeneo has promised something which does not belong to him – another personʼs life. Having made an oath which he realises belatedly is invidious, he tries to find a way out of it. The result of that is an ʻunnaturalʼ sequence of events – he must repudiate his son, deceive his people, permit suffering, and ultimately accept the prospect of sacrificing his son, and his own and everyone elseʼs happiness. In short, he must deny all of those duties which the civically-minded monarch would consider to be the sine qua non of kingship. The opera shows that the very human impulse of trying to find a way out of his dilemma is, in this circumstance, not a very royal one. In other words, in behaving like a father he is refusing to behave like a monarch, and vice versa. This is the sort of quandary beloved of the French tragedy – but the parameters of this quandary are very new territory. The notion that the lives of a kingʼs subject were not his personal property is in itself a quite extraordinary ideological development and certainly does not belong to classical Greece or even Louis XIVʼs France. Instead it is very tightly connected to ideas of the rights of man, equality before God, and the social contract which binds even the king. A king bound by a social contract is only as good as his word, and it is here that Idomeneoʼs situation becomes particularly pitiable. For it is by his word – his oath to Neptune – that he has caused the catastrophic situation in the first place. The suffering of the people of Crete under the ravages of an irate Neptune makes Idomeneoʼs obligations very clear to him – by being their king he is responsible for the welfare of the many, no matter what it may cost him personally. This is based very firmly on an Enlightened view of the nature of his monarchy – Homeric virtues are no longer valued in this world. Civic virtues are what the state needs. The profound social responsibilities of kingship are thrown into relief by the characters of Ilia, the Trojan princess, and the Greek princess Elettra. Both Ilia and Elettra are themselves royalty, but have been forcibly absolved of their royal and personal responsibilities. Ilia, as she articulates in her opening aria, has lost her family, her home and her position. Elettra is a refugee from the domestic catastrophe which emerged from the return of her father Agamemnon and his subsequent murder. Elettra – Electra – is as an audience familiar with Greek dramas would know her, but the surprise is that she is the nearest that the opera comes to a villain. She is a character out of place in an Enlightened age – refusing to moderate herself or act out of consideration for others, and not embracing a social role. Instead, she expects society to adapt itself to her, and when it does not, she seeks to absent herself from it. By contrast, Ilia, the ʻenemyʼ captive, refuses to put her own desires before the state necessities which drive her lover Idamante. Furthermore, she seeks to integrate herself into her new society – seeking a new family and home in Crete. In doing so she has acknowledged the significance of those social ties and displayed an awareness that nobility is earned by comportment and not simply by blood. All of the characters end up revolving around Idamante, the intended sacrificial victim, the lover of Ilia, the unrequiting beloved of Elettra, the king-in-waiting. By trying to defend Crete from the monster sent by Neptune, and then by accepting that the needs of the people supersede those of any individual, he proves himself worthy where his father has failed. When Neptune decrees Idomeneoʼs abdication and Idamanteʼs accession, it is a vindication of selfless and enlightened monarchy, and of a monarch who seeks to resolve ancient hatreds by marrying a Trojan princess. The events of the opera mark the passing of the age of Homeric heroes like Idomeneus and Electra, who are individuals who put their own interests first, and the dawn of a civic age of Idamante and Ilia, who understand that leadership is first and foremost about unity and responsibility. When Idomeneo is regarded in this light, itʼs very easy to see that the Mozart who wrote it was very much the same Mozart who would go on to write operas extolling the virtues of forgiveness (in The Abduction from the Seraglio), integrity (The Marriage of Figaro), self-discipline (Don Giovanni), selfknowledge (Così fan tutte), wisdom (The Magic Flute) and clemency (La clemenza di Tito). Mozart was nothing if not a man with an agenda – but what makes this aspect of his output so palatable is that his was the most enlightened, humane and positive of agendas. The music adds a dignity and emotional clarity which make it hard to resist, even if we wanted to. Idomeneo has spent ten years in the Trojan wars and is awaited with longing by his son Idamante. Among Idomeneo’s prisoners of war is the beautiful Princess Ilia, with whom Idamante has fallen in love, and despite their respective positions as captive and victor Ilia also secretly loves Idamante. Idamante is already betrothed to the Greek princess Elettra, whose jealousy grows as she sees Idamante lose all interest in her. Idamante learns that Idomeneo has been killed during a storm at sea off the coast of Crete. Beside himself with grief he runs down to the beach in the hope of finding some relic of his father. Neptune has spared Idomeneo in return for his promise to sacrifice the first living creature he meets on the beach. When Idamante appears Idomeneo realises to his horror that he must sacrifice his own son, and to Idamante’s despair his father flees from him without telling him why. Idomeneo desperately tries to avoid fate: he orders Idamante to take Elettra back to her homeland, thus getting him away from the island and preventing Neptune from exacting the promised sacrifice. As they board their ship a violent storm erupts and a monster appears from the sea. Idomeneo confesses that Neptune wants to punish him. Crete is ravaged by plague and the sea monster continues to rage on the beach. Idamante bids farewell to Ilia as he sets out to kill the sea monster. Ilia admits her love for him. The High Priest seeks out Idomeneo in order to force the truth out of him: the gods are claiming new victims every day, and as king, Idomeneo must live up to his responsibilities. With a heavy heart Idomeneo finally reveals that only when his beloved son has been sacrificed to the gods will his people be released. Idomeneo must bow to Neptune. He prepares for the ceremony. Idamante gets ready to fulfil his duty as a sacrificial victim but Ilia intercedes: she wants to give her life for Idamante’s. The gods are appeased by this manifestation of true virtue and love; they decree that Idamante and Ilia shall rule instead of Idomeneo, who is thus absolved of guilt. The people rejoice as Elettra rages. Idomeneo hands over the throne to the young lovers gladly and the opera ends happily. Mozart’s writing for his opera orchestra is full of gesture and colour. Every single detail is emphasizing the drama – the characters and the story. When Mozart is played on modern instruments, the players need to ‘tone down’ their sound a lot. With classical instruments, the orchestra is already perfectly balanced. The strings play on gut strings, and everything is at a lower pitch (about a quarter of a tone), which means all the stringed instruments sound mellower, softer and sweeter. The players can use all the range of colours – from something highly dramatic and loud to an exquisitely soft and blended sound, and everything in between. The wind players also play on the highly colourful instruments for which Mozart composed his score. Every interjection or melody on oboe, flute, bassoon or horn comes across in perfect balance and with the specific colour he wanted. The score absolutely comes alive! This also goes for the far greater subtlety of the trumpets, trombones and timpani, who can blend or make an impression at will. As well as all this, classically trained players use ‘authentic’ performance techniques. This kind of knowledge means that phrases are played with tremendous attention to detail – every phrase contains a gesture of some kind. Players think about these gestures all the time ... it is a highly involving process playing this music. The string players will use a wide palette of bowings, and much less vibrato than in a modern orchestra. It is a very beautiful affect, hearing such transparency of sound, and will be quite revelatory. Classical string instruments are different from those in a modern orchestra. These instruments, like baroque ones, will mostly have lighter fingerboards and tail pieces, although we will probably have a bit of a mixture, as in Mozart's day modernization was already occurring and in the 1790's some experimentation was happening. The bow is probably the most important feature that affected style. Bows became curved inwards, as instrumentalists sought to imitate the new bel canto style that sustained long elegant phrases. An inwardly curving bow sounds naturally more even throughout its length. Classical bows feel extremely light to use, and it's impossible to make a heavy sound. Leopold Mozart, Amadeus' dad, describes our bowing style perfectly, when he writes in his treatise for violin players: "Every tone, even the strongest attack, has a small, even if barely audible, softness at the beginning of the stroke ... this same softness must be heard also at the end of each stroke. Hence one must know how to divide the bow into weakeness and strength, and therefore how by means of pressure and relaxation, to produce the notes beautifully and touchingly." Music in Mozart’s day was meant to stir the heart by means of rhetorical devices. Think of the bow as being the equivalent of an orator's voice, with declamatory pauses, gentle inviting tones, sudden attacks, and the constant use of emphasis and de-emphasis. Despite bows advancing towards our modern ones, we will still use a lot of light and shade, and far more articulation than a modern orchestra would. Our vibrato will be minimal, as it was still used as an expressive device. The size and acoustic of the City Recital Hall are ideal for this music, as we will not need to make the sort of volume of sound a large concert hall requires. Compared to a string player in a modern orchestra, we enjoy enormous freedom in playing expressively and rhetorically, simply because we do not need to play so loudly. The people welcome Elettra (Penelope Mills) as Idamante's future bride invoking the blessing of the sea. Penelope Mills, Cantillation, Orchestra of the Antipodes, Antony Walker conductor. 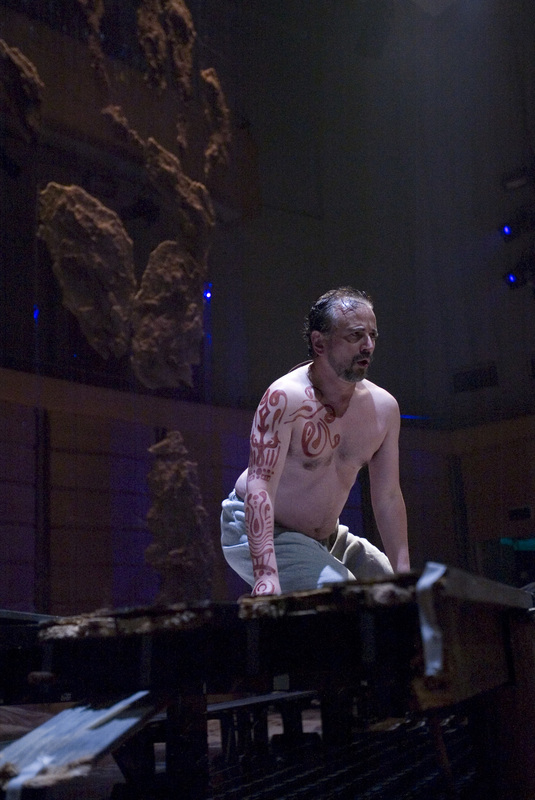 The gods have unleashed a series of terrible events and monsters upon Idomeneo's people, who are confused and afraid. Cantillation, Orchestra of the Antipodes, Antony Walker conductor. Idomeneo and the priests plead with the gods for their favour, making offerings and promises. Mark Tucker, Cantillation, Orchestra of the Antipodes, Antony Walker conductor.